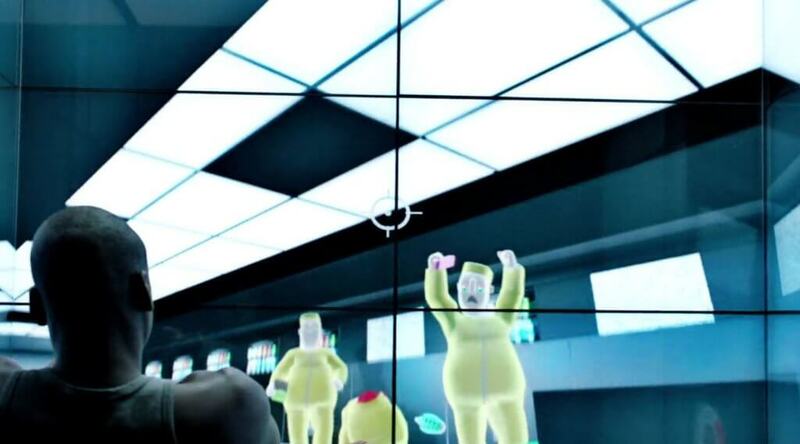 Black Mirror‘s title beautifully condenses what the show is about. Two words are enough to conjure up a mood and inspire visions of what may happen if our digital dreams go awry: implants that store memories for later undiluted recollection, videogames played inside our minds, societies ruled by social media popularity, or people’s consciousnesses turned into smart-building apps. Each episode begins with a loading screen, a white circle on a black background that metamorphoses into the title. Throughout this brief sequence, a disturbing noise ratchets up into a heartbeat flatline. This sustained tone shatters the glass, inevitably reminding us of the physical screens in front of us. As Charlie Brooker wrote for The Guardian, back in 2011, “The ‘black mirror’ of the title is the one you’ll find on every wall, on every desk, in the palm of every hand: the cold, shiny screen of a TV, a monitor, a smartphone.” Now that the show is on Netflix, it’s readily available on all these “black mirrors,” making us uneasy about the same tools enabling our binge-watching. For the cold, shiny screens to function as black mirrors, they must be turned off. But even then, or especially then, they survey us from the walls of our living rooms. We’re reflected in their surfaces, trapped in their frames. When we turn them on, our reflections recede behind the light, become indistinct, yet we’re still there – or we used to be. Mirrors of all sorts have long been seen as objects of magic or – to quote Daffy Duck in “Rabbit Seasoning” – as pronoun trouble. They blur the boundaries between I, he, she, and they, our reflections both us and not us. In his famous short story “Tlön, Uqbar, Orbis Tertius,” Jorge Luis Borges writes, “From the remote depths of the corridor, the mirror spied upon us. We discovered (…) that mirrors have something monstrous about them. Then Bioy Casares recalled that one of the heresiarchs of Uqbar had declared that mirrors and copulation are abominable, because they increase the number of men.” Mirrors are not the only objects that “increase the number of men.” Fiction does too. In a later short story, “Borges and I,” the author writes, “The other one, the one called Borges, is the one things happen to.” In his books, in the media, and in the history of Argentine letters, a new version of the author had been born, a version that would outlast his physical manifestation. Borges would often feature as a character in his work, and it’s this “other one” who now continues to speak to us, not his mortal twin. Just as mirrors reflect and multiply us, so can storytelling, whether we author it or find ourselves drawn to its characters, those who become extensions of us. The monitor in our living room includes our opaque reflection; the show’s protagonists, struggling with technology, remind us of our own troubles. This double likeness – on the physical screen and the fictional narrative – bridges both sides of the mirror. In other words, the show folds the act of watching it into its overall meaning. This was the idea behind season 3’s cheeky Netflix Vista faux-ad, which lampoons our obsession with the streaming service by imagining a future where, thanks to special implants and AR-enabling contact lenses, we’re consuming TV series all day, every day. Of course, mirrors don’t offer perfect reproductions; something is always slightly askew. Another world, like our own – but twisted – awaits on the other side, as Alice discovered in Lewis Carroll’s Through the Looking Glass, or as the protagonists did in Goosebump’s Let’s Get Invisible! In this sense, Brooker’s show inverts our presence – and our present. All the dysfunction hiding beneath our daily habits is brought out into the open. Like the twisted worlds of mirrors, the screened reality is instantly recognizable and unspeakably odd. We’re not looking at what is, but what could be. The practice of viewing things through a gloomy, cloudy mirror has Biblical resonances. Specifically, in the King James Bible, in 1 Corinthians 13, we read: “For now we see through a glass, darkly.” The word “glass” is a tad ambiguous here, but more modern translations, like the New Revised Standard Version, call it a “mirror.” Admittedly, this one isn’t exactly black. It’s likely made of polished bronze, perhaps a little dim or rusty. And it doesn’t reveal the nightmarish underbelly of our daily habits, as argued above, but rather conceals a full view of divinity, which can only be known “in part” from our terrestrial realm. Nevertheless, we can still recognize faint echoes of Black Mirror’s more secular themes: a mediated existence, a life lived in a shadowy reflection, a replacement reality on a murky surface. Historical black mirrors, as Arnaud Maillet notes in his book about their significance in Western art, have been used for necromancy and catoptromancy, believed to be a source of errors and illusions, connected to death and transgressiveness. They have also been part of painters’ kits. In the 18th and 19th centuries, picturesque artists, in an effort to recapture the tones of Claude Lorrain’s crepuscular 17th century works, took to using tinted, pocket-size convex mirrors, later labeled “Claude mirrors,” which weren’t always black or the same shape and size, but which usually served to delimit and focus a scene, simplify detail, and bring out desired colors. As Jazmina Barrera writes for Faena Aleph, these “were not famous for reflecting reality as it is; they were famous for improving it.” 19th century art critic John Ruskin was somewhat less impressed, calling it “one of the most pestilent inventions for falsifying Nature and degrading art which was ever put into an artist’s hand.” When employing a black or Claude mirror, artists turned their backs on the portrayed scene and reproduced its reflection. If we were to be uncharitable, we might say, following Ruskin, that this gadget signaled a retreat from truth, an attempt to find inspiration not in nature but in its optical mutation. There’s a two-pronged argument here: an embrace of mediation running alongside a cautionary message. All technologies of vision reveal some things and distort others. The point of the research project is not that we should seek out the Really Real beyond our technological tools, but that we shouldn’t forget that the act of mediation is always there – and that, perhaps, there is no other way to approach nature. That’s the ultimate theme of Black Mirror. Despite its foreboding, dystopian portraits of cutting-edge tech, it depends on such innovations to exist. Rather than vying for a nostalgic return to pre-digital times, it advises prudence. We can’t turn back, but we should be careful moving forward, lest we fall into a trap. And this warning necessarily comes from within our online present, because that’s where the battle is being fought.